UnderstandingAutoimmune's mission is to inspire you through interviews with experts & others’ courageous success stories of their autoimmune experience so that you too can thrive! How Far Are You Willing To Go ... To Live? #213 Can Finding Your Purpose Help In Healing? Did you know there are over 100 conditions that people are suffering with everyday that compromise their immune systems and if it’s not one of the “big ones” like rheumatoid arthritis, multiple sclerosis, lupus or Hashimoto’s thyroiditis you might be told it’s all in your head…. 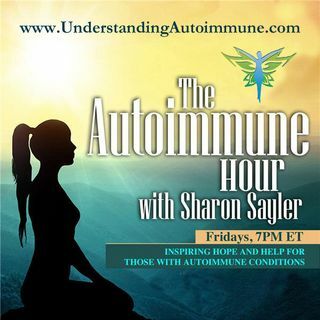 Your host for The Autoimmune Hour, Sharon Sayler knows, ... See More she’s heard that over and over again. It was her struggles to find the right answers that created what friends call an “irrational-passion” to encourage and inspire others to live well, whole and complete… and that is how The Autoimmune Hour on Life Interrupted Radio was born… the premier location for information to empower you to live well, thrive and create a happy, healthy, wealthy life regardless of your diagnosis.